Pennsylvania was the only state to be issued the warning from the US Environmental Protection Agency regarding Chesapeake Bay. Stretching more than 200 miles from Havre de Grace, Maryland to Virginia Beach, Virginia, the Chesapeake Bay is the third largest estuary in the world–and the largest in the United States. It should come as no surprise, then, that research conducted by the University of Alabama estimates that ever since the 19th century, the Bay’s water quality has increasingly become impacted by animal and human waste. While Chesapeake Bay is home to more than 3,600 species of plants and animals– and supports roughly 18 million people with an estimated $1 trillion of economic activity–the rising threat of Bay-related pollution is imminent. As such, the US Environmental Protection Agency (EPA) issued a letter on April 27, 2017 to Pennsylvania, calling for the state to speed up the process of looking after pollution control. Pennsylvania delivers more nitrogen than any other state into the Bay. As it stands, the EPA alleges that Pennsylvania is only 10 percent of the way towards its 2025 nitrogen goal. In order to meet those goals, the EPA states Pennsylvania will need to reduce its nitrogen pollution by roughly 4 million pounds per year. “Given the serious deficits in attaining load reductions in the Agricultural and Urban/Suburban Stormwater sectors, EPA commits to continue working with Pennsylvania in the development of Pennsylvania’s Phase III WIPP so as to provide technical assistance and feedback along the way,” the letter reads. The EPA letter continues, stating it will review the details of the state’s draft Phase III WIP next year “to assess the adequacy of the programs and policies,” so that the Commonwealth will meet its 2025 Chesapeake Bay Total Maximum Daily Load (TMDL) goals. While the Chesapeake Bay spans across several other states, Pennsylvania was the only state the letter was issued to. As the Bay Journal notes, the other states surrounding the Bay are on pace to meet their required pollution reductions. That said, they also now have to finish their plans by 2018 that show how they will “restore a healthy Bay” by 2025. All that being said, there are, in fact, cleantech companies out there putting in best efforts to help Pennsylvania get on track with its Chesapeake Bay obligations. “Pennsylvania is just one state out of more than 35 in the nation that suffer from this same environmental problem,” Scott continued. With the Chesapeake Executive Council signing a resolution asking for federal support to clean up the Bay–which comes after President Donald Trump slashing the funding in his budget proposal–many private companies will likely benefit from reduced federal funding, Scott said. Scott continued, saying that a number of states will look to make spending decisions with “more of an eye-to-cost-effectiveness,” highlighting that many stakeholders at the Pennsylvania Joint Senate Committee brought that up at a hearing in 2016. “This has never been an opportunity for the private sector before–EPA essentially signalling their approval for a whole new space.” he added. This is an update to an article originally published in 2016. Securities Disclosure: I, Jocelyn, hold no direct investment interest in any company mentioned in this article. Editorial Disclosure: Bion Environmental Technologies is a client of the Investing News Network. This article is not paid-for content. 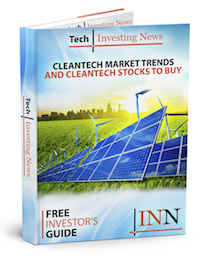 Get the latest information about companies associated with Cleantech Investing Delivered directly to your inbox.